Organic, small batch sake from a Kansai region of Japan. 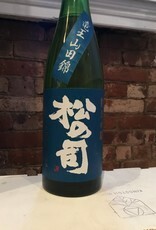 A terroir-driven sake, all the rice and water are from the same area. The rice is polished to 50% of its original size, technically suitable for Diagingo status. Brightly fruity and abundant umami is the dry style sake, an exceptional bottle for a connoisseur or those that just really like small made with talent and quality ingredients. The Matsu no Tsukasa Junmai Ginjo embodies the philosophy of brewmaster Keizou Ishida to make sake whose taste is as natural as the air and water that surround the brewery. Made in small batches from Ryuo Yamada Nishiki rice grown locally by brewery workers and then milled to 50%, this could technically quality as a Junmai Daiginjo but the brewery would like it to reflect what they consider the quality of their Junmai Ginjo. The sake practically vibrates with energy: rich, luscious flavors reminiscent of Muscat grapes, stonefruit and rich rice umami that finishes clean.